I don't need to submit interaction, so I created a Drag Over trigger for my text box. I can drag it, but I can't drop it anywhere as it snaps back. Is there anyway to prevent snapping back without using the Free-Form question? The best way i know how to do this is to make it a Free-Form quetion. If you want the learner to be able to drop a draggable object anywhere go to Form View for your slide and select Drag & Drop Options under the Question window. Instead of having to submit the interaction turn off the Submit navigation controls under your slide properties (Gear icon in your slide layer window) Just make sure the learner has a way to advance the slide after! Wendy, is there a way to make it so it can be dropped anywhere with that trigger? Jack, my issue with making it a Free Form Question turns it into an item that is always on top, and I don't want it to be. can you upload the story file - might be easier to help you if we can see the setup and what you are trying to achieve. OK, thanks! You can ignore the slider, I need to redo the tabs so that each stop correlates with a month. I was trying to it another way and realized it would take forever. Basically, I want them to be able to drop the event onto the calendar month. Then, if they move to another month, I want it to be stuck on that month:). Hope that makes sense, this may be the impossible! so if I drop signed order onto 6th March and they move to April you don't want signed order to be visible on the April calendar? is that what you mean? You want it to stay on 6th March and not be available again to be re-dropped on another month? Exactly! You got it, thanks for your help. 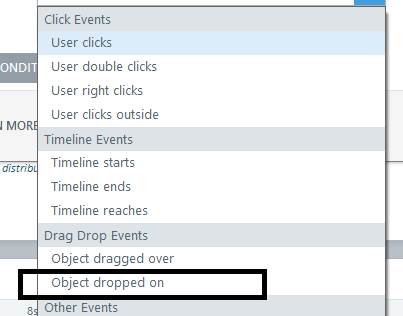 I don't know if it's possible, because as far as I can tell a dropped object is always on top? I don't think what you want can be achieved. I have created a sample file that may or may not work for you - very simplified but it could have all the months (I have only have 3) on the base slide. I then created 3 drop targets on each month that the drag items could be dropped onto. So you can have 3 things happen in January or 1 in Jan 2 in Feb or none in Jan etc- you would increase for the number of drop items you have. It may be far removed from what you want but I couldn't see any other way other than perhaps creating an infinite amount of drop targets for the days of the month and it removed the need for a slider or month tabs. If the items are 'day of the month' specific then mine will definitely not suit your needs. Hope it helps or gives you an idea of how it could work. I have little issue when i drop my object on drop target then drop object is hide. Are you able to share your .story file so that we can take a look at what you've set up? You can attach it here using the "add attachment" button at the bottom of the reply to the forum thread. Looks like Wendy beat me to it over the weekend, but glad that'll work for you Ahesan! "Hi Sarah I don't think what you want can be achieved. I have crea..."
"Hi Ahesan see if this will work for you"